We’ve been here before, of course: clenched teeth, slight headache coming on, standing in the garden looking at the dead leaves with rake in hand wondering if we could hide behind a big pile when the call comes from the house dragon: ‘It’s here, the numerical. Let’s get on with it!’ Like any New Man, we spinelessly do what we’re told. 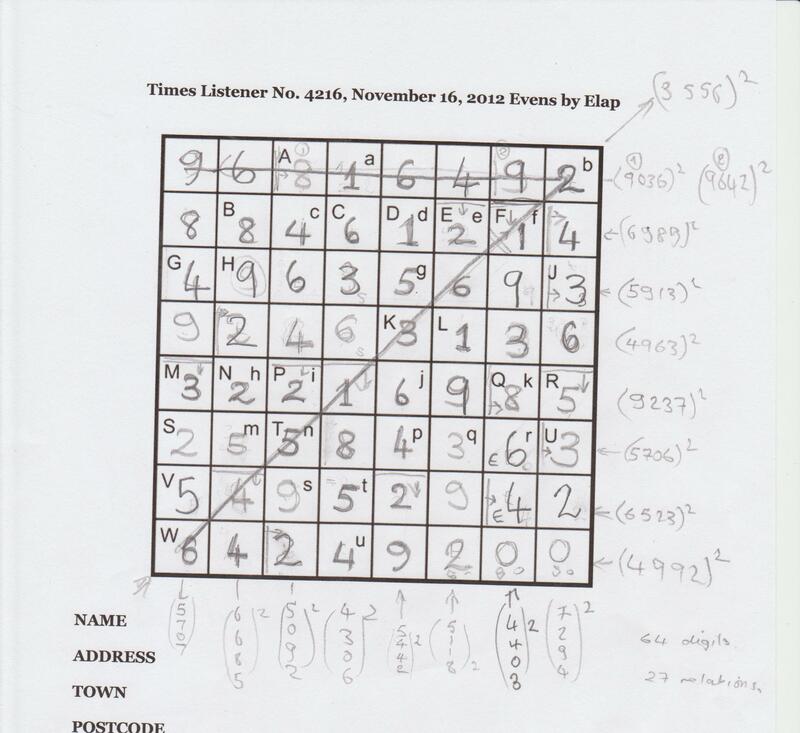 Elap, ‘Evens’, 8 x 8, 64 digits to divine and 27 clues. Wasn’t it Elap who produced the triangular numbers puzzle? I think at once of ‘Beautiful Mind’, imaging Elap in his e-garret surrounded by multi-core processors humming away while looking at a wall covered with sheets of paper and pictures, seeing patterns that totally escape us ordinary mortals. Get a grip! To work…. Great progress on Friday: one digit in place! containing just one digit after an hour or so. Is there no alternative to trying options for j2, an even, 2 digit square? Is there not some easy way in somewhere else and are we just stupid? 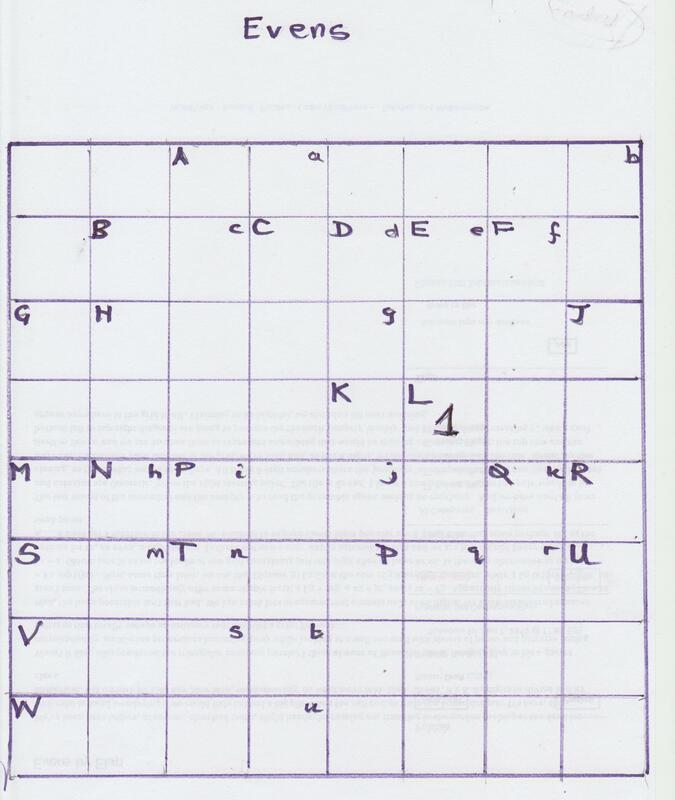 Every entry A, B, .. , a, .. , u does get a mention in the clues. No oddities to exploit there. Most popular are a2, d4, j2 and t2, hinting again perhaps at j as the weak point. The last resort of the scoundrel and the numpty is to read the preamble again, seeking an epiphany. And we have one! All rows and columns are thematic, ‘given the right starting point’. The title is ‘Evens’. I know a compiler who loves to ‘cycle’ words in his clueing, so that’s what we are to do here. All these 8 digit numbers share the ‘property’ when cycled around, one ‘doubly’ in some way. There’s another such number in the grid, we’re told, and, as it is 8 digits, it can only be a diagonal. The title, ‘Evens’, cycles itself to ‘Seven’ and we are ‘to draw lines to represent something that would be missing otherwise’. Great: the top row and the bottom left to top right diaganol are going to possess the thematic proprty ‘doubly’ and be shaded, representing 7, which can’t appear anywhere in the grid itself. Claiming to be hopeful, we abandon till next morning. Progress is made: from the 17 sheets of notes, I see we followed the j2 hints and found j2 = 64 and a2 = 16 . The Square 9 clues with 4 t2 = P3 (which now ends in 6) then gave options t2= 14, .. , 94 but t2**4 has to be a 7 or 8 digit number: t2 is one of 34, 44 or 54. As 4 t2 = P3 and N2 is in the clues so even, P1 can’t be 1 and t2 = 54, P3 = 216 and u3 = 416. Square 6 next yielded F2 = 14 or 16 and T2 = 58 or 74. Going along with our preamble reading, no sevens, 74 was excluded…. Nibbling away with what we could spot as small restrictions in the clues, we found W1 = 6, D1 = 1 and L1 = 1. Then, realizing we knew the area of square 9 (t2**4) we could find that B2 = 84. On and on, but what were we missing? Was this really the expected approach? Finally, we had four sides of squares established: 112, 256, 562 and 2916. These, the preamble states, ‘also exhibit the thematic property’. They seem unremarkable except that 256 is of course a square (16**2).. and 562 can be cycled to be 256, also square, as can 112 (to 121, 11**2) and 2916 is 54**2! Anyhow, congratulations to Elap: another intriguing numerical: I wouldn’t have thought 8 digit squares (only about 7000 of these), even ‘cycled’, would offer sufficient matches to fill this grid and a diagonal if no 7 were to appear. I suspect that, even now, Elap is firing up his processors, cackling with fiendish delight as his electronic assistants scan the digits of pi or somesuch to offer us a future torture session! This entry was posted on 7 December 2012 at 5:02 pm	and is filed under Solving Blogs. Tagged: Evens by Elap. You can follow any responses to this entry through the RSS 2.0 feed. You can leave a response, or trackback from your own site.